F. J. Duarte, Narrow-linewidth pulsed dye-laser oscillators, in Dye Laser Principles (Academic, New York, 1990) Chapter 4. F. J. Duarte, Technology of pulsed dye lasers, in Dye Laser Principles (Academic, New York, 1990) Chapter 6. F. J. Duarte, Dispersive dye lasers, in High-Power Dye Lasers (Springer, Berlin, 1991) Chapter 2. F. J. Duarte and D. R. Foster, Lasers, dye, technology and engineering, in Encyclopedia of Applied Physics, Volume 8, G. L. Trigg, Ed. (VCH, New York, 1994) pp. 331-352. T. F. Johnston and F. J. Duarte, Lasers, Dye, in Encyclopedia of Physical Science and Technology, Third Edition, Volume 8, R. A. Meyers, Ed. (Academic, New York, 2002) pp. 315-359. 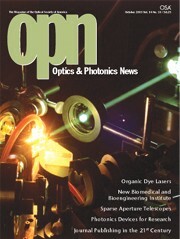 F. J. Duarte, Organic dye lasers: brief history and recent developments, Optics and Photonics News 14 (10), 20-25 (2003). F. J. Duarte, Tunable Laser Optics (Elsevier Academic, New York, 2003) Chapter 7. F. J. Duarte and A. Costela, "Dye lasers," in Encyclopedia of Modern Optics, B. D. Guenther, Ed. (Elsevier, New York, 2004) pp. 400-414. F. J. Duarte and R. O. James, Tunable lasers based on dye-doped polymer gain media incorporating homogeneous distributions of functional nanoparticles, in Tunable Laser Applications, 2nd Ed. (CRC, New York, 2009) Chapter 4. F. J. Duarte, Tunable organic dye lasers: physics and technology of high-performance liquid and solid-state narrow-linewidth oscillators, Progress in Quantum Electronics 36, 29-50 (2012) (Invited). F. J. Duarte, Dye lasers, in Handbook of Lasers and Optics, F. Träger, Ed., (Springer, Berlin, 2012) Chapter 11 (Invited). Page published on the 1st of February, 2004; Last updated on the 13th of March, 2015.